Lock in a great price for Hotel Marhaba Beach – rated 8.2 by recent guests! Good value for the money, nice facilities and a cool sheesha bar. I never go to all inclusive places or generally big hotels but this was such a value I did it and I was blown away by the value. I seriously can't understand what people who don't give this place excellent reviews are thinking. Anywhere in Europe or the states you would pay more than five times for this. Is it mildly "outdated"? Maybe but what does that mean? It was spotless, marble, spacious room, super comfortable, the pool was great, the beach was clean - not perfect but it seems that is sadly a Tunisia thing but this beach was absolutely clean enough. The food was great if you chose well. Some of the locally cooked items were just like what you would find when you ate at local places if you left the property. I like to enjoy cultutural visits but I had been traveling around for two weeks and this seemed look a good rest. I can't imagine if this is the type of place you like that it wouldnt be an unbelievable find for a fraction of the cost. Things can be improved considerably but overall the amount charged compensates sort of the disadvantages hotel has. The salon services are really good and fish pedicure guy is really good. Great location. Very clean, friendly staff and amazing food. Marvellous beach view from the balcony, wonderful breakfast, beds not too soft, very clean, big bathroom and exceedingly much space to take a shower, quiet garden area, heated Indoor pool available, all the staff were friendly and spoke German very well. Breakfast was included, we got a very good deal on the room, the view from the room was nice. The pool is big with lots of lounge chairs. the hotel is so beautiful and the breakfast is really good and tasty, pool is amazing and there was always free water and biscuits in the hotel foyer. Everything, specially the stuff so polite and helpful and the food was various and delicious. The room was spacious , the view also was amazing. Hotel Marhaba Beach This rating is a reflection of how the property compares to the industry standard when it comes to price, facilities and services available. It's based on a self-evaluation by the property. Use this rating to help choose your stay! 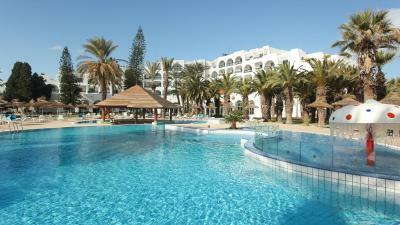 One of our top picks in Sousse.This hotel with 2 swimming pools, a 2-minute walk away. It offers a spa including massage treatments, a thalassotherapy center and a show twice a week. 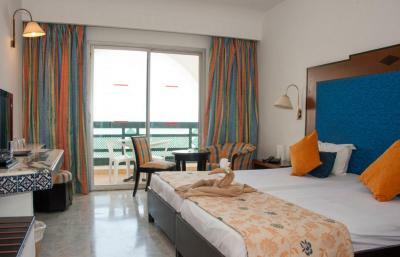 Each room with attached bathroom includes a balcony with a view of the garden or the sea. All the air-conditioned rooms at Hotel Marhaba Beach have satellite TV and a fridge. Each morning a buffet breakfast is available. 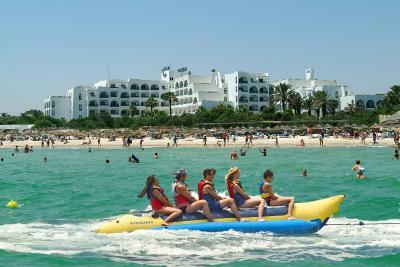 The hotel offers a choice of 3 restaurants, snack bars and 5 bars, including a bar on the beach. Other services include a fitness center, kids club and a beauty center. 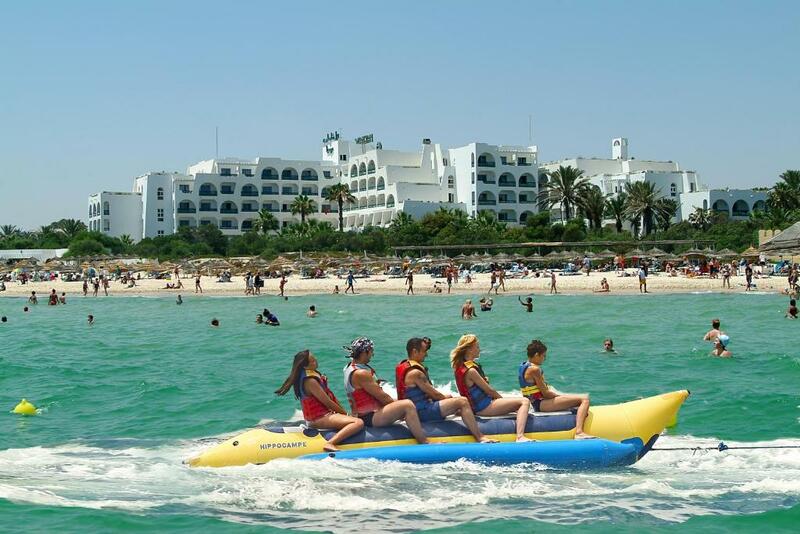 Located 1.9 mi from central Sousse and its train station, this hotel is a 30-minute drive from Monastir–Habib Bourguiba International Airport. It also provides free parking and a tour desk. When would you like to stay at Hotel Marhaba Beach? This room has air conditioning, a satellite TV and a private bathroom. It features a balcony with a view of the garden or the sea. House Rules Hotel Marhaba Beach takes special requests – add in the next step! Hotel Marhaba Beach accepts these cards and reserves the right to temporarily hold an amount prior to arrival. Please note that beach and pool towels are available with a deposit. Kettles and irons are available upon request at the reception. Beach could be cleaned up better. The hotel is dated. I stayed at the end of March. The other clientele was at the higher end of the age range, who seem to be on all-inclusive packages and some of whom have many needy complaints to bother the staff with ("my room is too far from the elevator" was one I heard). Sleeping was a little rough as the hotel plays very loud music until midnight. I could have probably resolved this by asking for a room change, but I didn't, so the fault is on me. We booked our complimentary 'a la carte' dinner and, because they made a mistake with the days, we ended up being booked the following day in the main restaurant. We were served by the waiters, everything was great, the food came promptly, prepared just for us. The next morning, on our day of departure, my partner and I suffered a major food poisoning case. I would not recommend eating in the "a la carte" restaurant, eat where everyone else eats because the food is really fresh and good. We both had the feeling that our "a la carte" food was microwaved and that the chicken soup was extremely old. Also, there is very little food (apart for salads) for vegans, lactose and gluten intolerant people. The clientele skewed quite a bit older than we were expecting, it was quite a long walk from the Medina/train station/restaurants. There is smoking allowed indoors at this hotel, so even though we stayed in a non smoking room the inside of the hotel smelled like cigarettes. The view from the balcony was mostly obstructed. Check in took very long. Double bed with gap in between. Indoor pool. Next to the beach. Breakfast buffet. My bedroom smelt of food all of the time - you get used to it when you’re in the room, but walking in every time was just horrible. The staff are amazing: so helpful and attentive. Buffet breakfast and dinner are excellent with lots of choice. And the pool / pool area is perfectly clean. Old inferior and simple facility，but for its price you can not complain about that. Great lobby, good beach, good staff, wonderful breakfast.